You really wanted to make it to this year’s Esri User Conference (Esri UC), but it just didn’t happen. The conference will be back in San Diego, California, in 2016—albeit a little earlier (June 27–July 1) so save those dates. It’s impossible to recapture the excitement of interacting with your peers in person; eyeing hundreds of beautiful, informative maps; watching live tech demos; and trying out GIS apps. But Esri’s video team has posted videos of the Keynote Address, plenary talks, technology demonstrations, and other 2015 Esri UC events at video.esri.com. Esri photographers took thousands of pictures of the event that have been posted on Esri’s Flickr photo sharing site. However, here is a quick overview of the highlights from this year’s conference. Esri president Jack Dangermond introduced the term geoenlightenment during introductory remarks at the Esri UC Plenary Session. What is geoenlightenment? Dangermond said it means understanding how things on our planet are interconnected and applying that knowledge to make the world a better place. “What we do here, affects there,” he said. Geoenlightenment will get a big boost from Esri’s Big Data for GeoAnalytics extension for ArcGIS for Server, which is slated for release next year. Mansour Raad, senior software engineer for Esri, demonstrated how Big Data for GeoAnalytics was used to analyze where to plant 87 varieties of corn hybrids in Indiana based on soil type, a specific time window, and heat and soil moisture. This added up to 300 billion spatial and temporal calculations. “We did these calculations in 10 minutes. Pretty cool,” said Raad. Esri just launched the R–ArcGIS Community on GitHub. The new initiative’s goal is to build a collaborative community for R and ArcGIS users. R is an open-source programming language for statistical analysis. “Now R users can directly access all their organization’s GIS data, and ArcGIS users can directly integrate R into their geoprocessing workflows,” said Esri’s Steve Kopp. Esri’s Nate Bennett got the audience up to speed on the new fast, responsive vector tiles. The audience responded enthusiastically. “Data is prerendered at various map scales, cut into tiles, then cached for quick delivery,” he told the crowd at the Esri UC, as he showed an example of vector map tiles on-screen. As the map rotates, the labels dynamically orient. 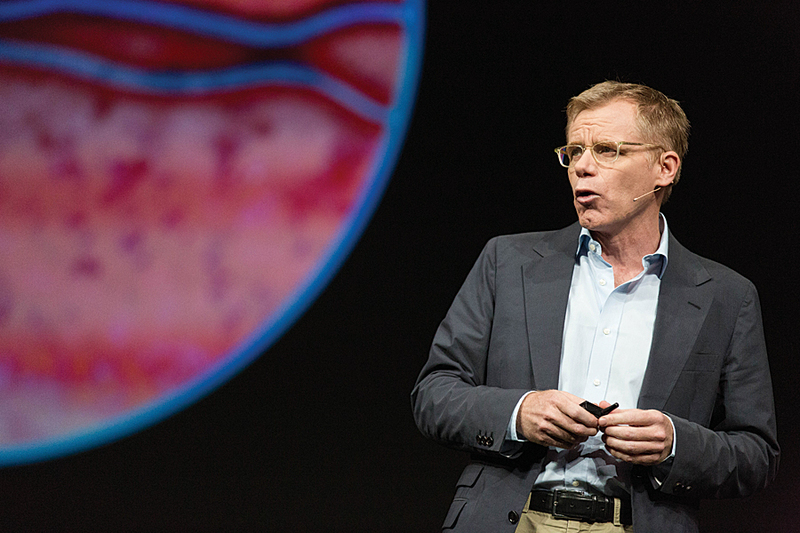 Dr. Bruce Aylward from the World Health Organization (WHO) shared stories about his work eradicating Ebola. Dr. Bruce Aylward from the World Health Organization (WHO) described the role GIS plays in the fight against Ebola. He took the audience behind the scenes of the battle to wipe Ebola off the map in West Africa. He credited GIS tools for everything from helping track the chains of virus transmission from one person to another to getting the food and medical support needed to the right locations. “This was a huge logistical effort, much of it guided by the kind of work that you do and by the kind of tools that have been developed through the GIS community,” Aylward said. Esri’s Ismael Chivite, Sathya Prasad, and Elvin Slavik demonstrated how to create native apps for multiple platforms in a snap using the configurable application templates and other functionality in the new AppStudio for ArcGIS. Best of all, no coding is required. 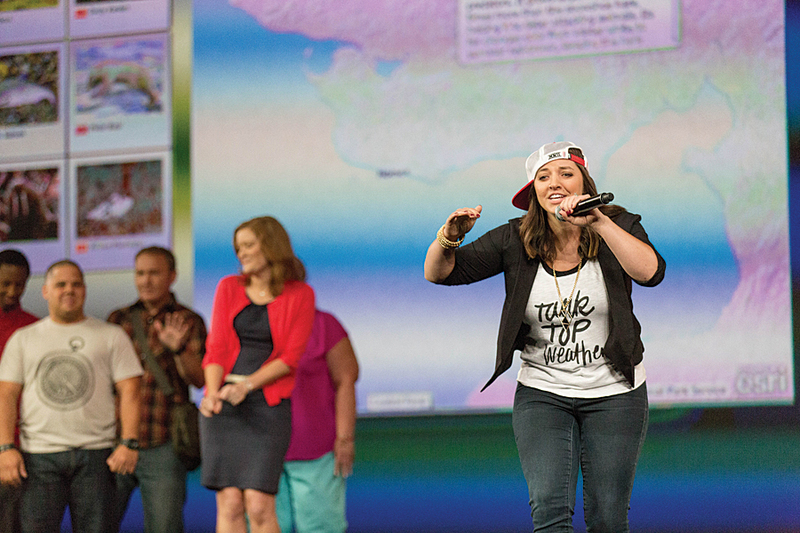 During the Plenary Session, Esri staff personified ArcGIS ready-to-use apps including this rapping Story Map app. Chivite playfully introduced Esri’s many ready-to-use ArcGIS apps during the Plenary Session as potential dates in a speed dating session. “Okay, you see, selecting the right app for the job can be sometimes challenging. You need to know what each of the apps do. Really, finding an app is like finding your best partner. After all, you’re going to spend so much time together,” said Chivite as he introduced Esri staff who personified the apps. Esri’s technology evangelist Bern Szukalski walked the audience through the top trends in web GIS, which included the increase in the number of portals, widely available hosted, easy-to-use analysis tools, introduction of smart mapping technology, and the popularity of Esri Story Maps. Dangermond honored many organizations with awards for their fine work implementing GIS, including Irish Water, which won the Enterprise GIS Award; Abu Dhabi, which received the inaugural Esri Smart Government Award; and the National Audubon Society, which won the Esri President’s Award. The International Centre for Integrated Mountain Development (ICIMOD) also was presented the Esri Humanitarian GIS Award for helping to provide Nepal’s government with vital information that helped officials better respond to and recover from the devastating earthquakes in that country earlier this year. 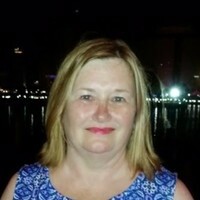 Carla Wheeler is a technology writer and editor at Esri and a former journalist. 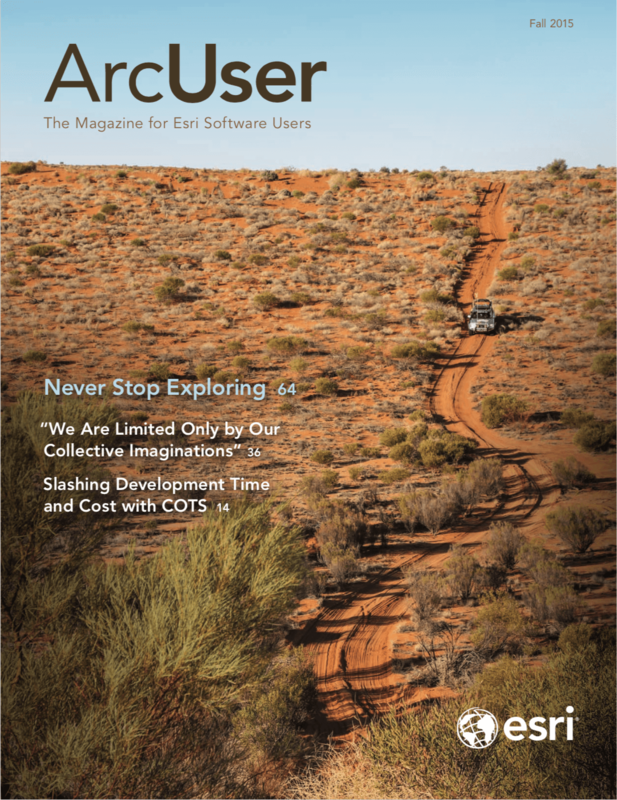 She currently edits ArcWatch and works with Esri Story Maps apps. Follow @gisjourno.